Blend all ingredients together until smooth. Pour in a bowl and top with your favourite super foods! Topping options: fresh fruit (local berries, mango, pineapple etc), shredded coconut, seeds, nuts, cacao, goji berries, granola. 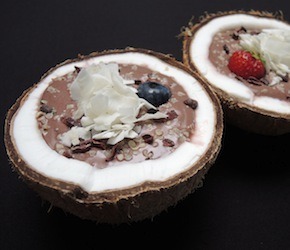 If you would like a high protein acai bowl, add your favorite protein powder. If you would like a green acai bowl blend with a big handful of spinach or a heading teaspoon of spirulina.